MEDINA, Minn. -- Scott Weiland, the magnetic frontman of the Stone Temple Pilots whose three-decade career in music also included solo albums and a spot in the supergroup Velvet Revolver, has died. He was 48. The singer's manager, Tom Vitorino, confirmed the death to The Associated Press early Friday. Vitorino referred to a statement on Weiland's Facebook page that said the singer passed away in his sleep while on a tour stop in suburban Minneapolis. The cause of death wasn't immediately released. Weiland's former Stone Temple Pilot bandmates - Eric Kretz and brothers Dean and Robert DeLeo - released a statement Friday thanking the singer, who was dogged by substance abuse problems throughout his career, "for sharing your life with us." "Together we crafted a legacy of music that has given so many people happiness and great memories. The memories are many, and they run deep for us," the statement read. "We know amidst the good and the bad you struggled, time and time again. It's what made you who you were. "You were gifted beyond words, Scott. Part of that gift was part of your curse. With deep sorrow for you and your family, we are saddened to see you go. All of our love and respect. We will miss you brother." Weiland rose to fame as the frontman of Stone Temple Pilots, which became one of the most commercially successful bands to come out of the early 1990s grunge rock movement. The band's 1992 debut album, "Core," was an insta-hit and sold 8 million units. The hit single "Plush" won the Grammy for best hard rock performance. The band's follow-up was a white-hot success, too: 1994's "Purple" hit the No. 1 spot on the Billboard pop charts, sold 6 million copies and launched the hits "Interstate Love Song" and "Vasoline." Stone Temple Pilots released more successful albums before they broke up in 2003, and Weiland went on to front Velvet Revolver, the group that featured former members of Guns N' Roses, including guitarist Slash, bassist Duff McKagan and drummer Matt Sorum, as well as Dave Kushner of Wasted Youth. Among that group's hits was "Fall to Pieces" and "Slither," which won the Grammy for best hard rock performance. The Stone Temple Pilots reunited in 2008. "The story's not finished," Weiland told the AP at the time. "There's more to be revealed and more to be told." But the group split again in 2013. Linkin Park's Chester Bennington took over as lead singer for Stone Temple Pilots but announced he was leaving the group last month. Police said Weiland was found dead in a bedroom on his tour bus in Bloomington, a city just south of Minneapolis. Police said they found cocaine in Weiland's bedroom and elsewhere on the bus, and that the local medical examiner was investigating Weiland's cause of death. 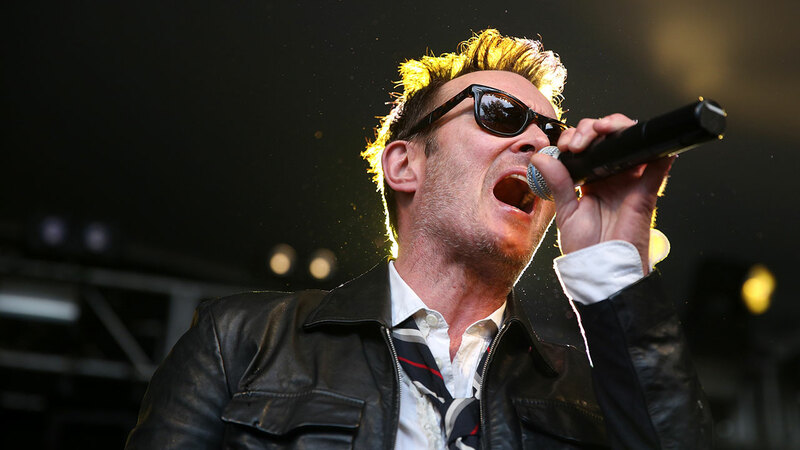 Weiland's current band, Scott Weiland & the Wildabouts, had been scheduled to play a show in nearby Medina, Minnesota, on Thursday night, but it had been canceled a week earlier due to poor ticket sales. Mark Raskob, general manager at the Medina Entertainment Center, said Weiland's show was canceled after fewer than 100 tickets had been sold for it in a venue with a capacity of about 1,800. Raskob said he was "bummed out." "The guy has just been battling addiction and it's sad to hear that he passed," Raskob said. Scott Weiland & the Wildabouts released the album "Blaster" in March. A guitarist for the band, Jeremy Brown, died at his home in Venice, California, a day before the album's release. Weiland's wife, Jamie Weiland, also confirmed his death to the Los Angeles Times. "I can't deal with this right now," she said, sobbing. "It's true." Weiland had a long string of drug- and alcohol-related arrests and stints in rehab. In 1995, he was arrested after deputies found him carrying crack and heroin. He pleaded guilty to felony heroin possession in 1998. And his arrests for drug possession and stints in rehab led the Stone Temple Pilots to cancel tour dates and contributed to their 2003 breakup.